This combination of flaky, nutty home-made biscuits, mini vanilla ice creams and glossy chocolate sauce needs very little preparation but makes an impressive dessert. Preheat the oven to 200C, gas mark 6. Line 2 large baking sheets with foil. Put the hazelnuts in a food processor and blend until finely chopped. Add the cinnamon and 1 tablespoon of the sugar and blend briefly. Sprinkle another 2 tablespoons of sugar on a clean work surface and roll out the pastry over the sugar to a 30cm square. Sprinkle evenly with half the nut mixture and lightly roll the nuts into the pastry with the rolling pin. Fold the pastry in half to enclose the nut mixture. Re-roll the pastry to a 30cm x 23cm rectangle. Sprinkle with the remaining nut mixture, then roll in gently. Trim the edges of the pastry and cut widthways into 1cm-wide strips. Twist each strip gently and arrange, slightly apart, on the baking sheets. Sprinkle with the remaining sugar and bake for 15-20 minutes until deep golden. Transfer to a wire rack to cool. Just before serving, place the chocolate sauce in a small pan and add the liqueur. Heat gently until warmed through. Fill a small bowl with very hot water. Dip each ice-cream tub into the water for 2-3 seconds to loosen, and press out on to serving plates. 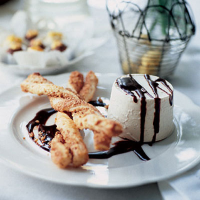 Drizzle a little sauce over the ice cream and serve with the hazelnut straws. Make the hazelnut straws up to 3 days in advance. Once cooled, store in an airtight container in a cool place.